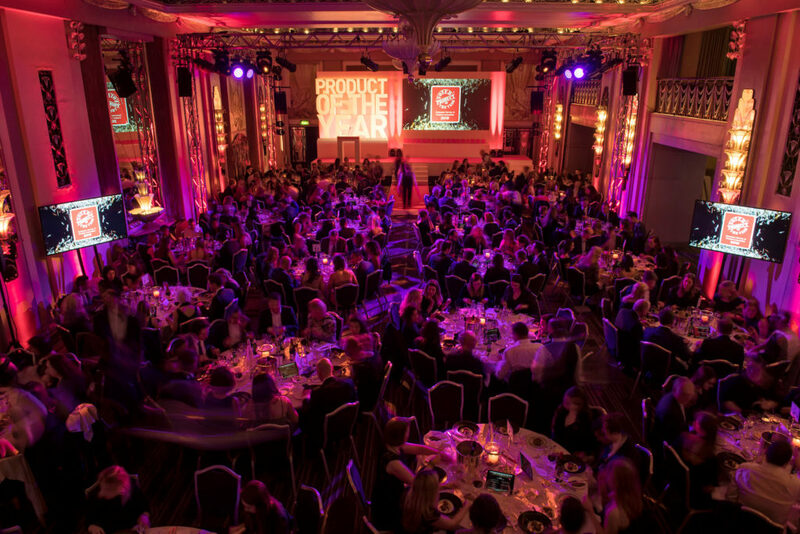 Last week I was invited to the Product of the Year 2019 Awards to celebrate the most innovative products on the market at the London Sheraton Grand Hotel on Park Lane. I have had a chance to be part of the Product of the Year jury since 2013. I love anxiously waiting for the winners to be revealed at the awards ceremony, which crow the best products from the last year, as voted for by the British public. Not only it was a night full of excitement, but also great food, wine and laughing with my jury friend Monica Costa from the London Mums online magazine. 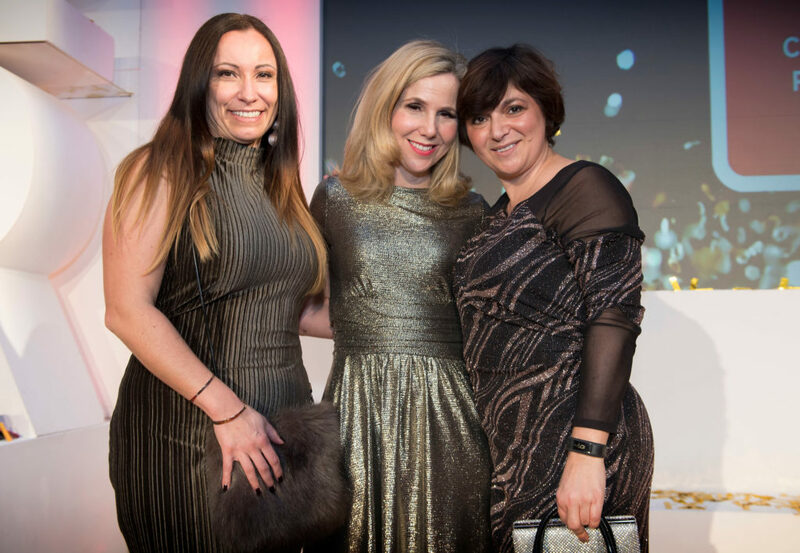 This year a great entertainment was guaranteed when Sally Phillips stepped on the stage! My jaws were aching from laughing! 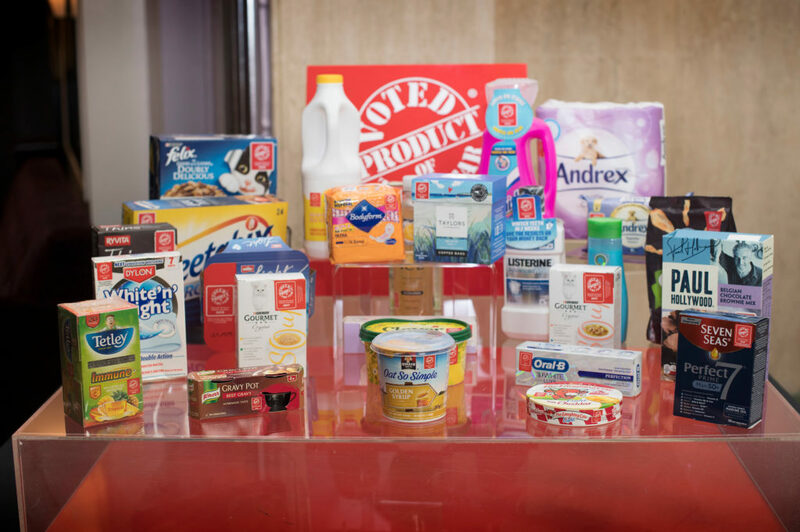 Product of the Year surveyed more than 10,000 consumers to discover Brits’ purchasing behaviour and preferences around new products. The research found that in these economically uncertain times, a competitive price is the most important factor affecting the products we put in our shopping baskets. Half (49%) of respondents named cost as the primary purchase driver, while 30% stated a product’s health credentials are the most important consideration for them. Only 12% of people questioned cited convenience as being of prime importance and even less (5%) were swayed by environmental factors. To my big surprise, when it comes to trying new products, nearly two thirds (60%) prefer to turn to friends and family for product recommendations. 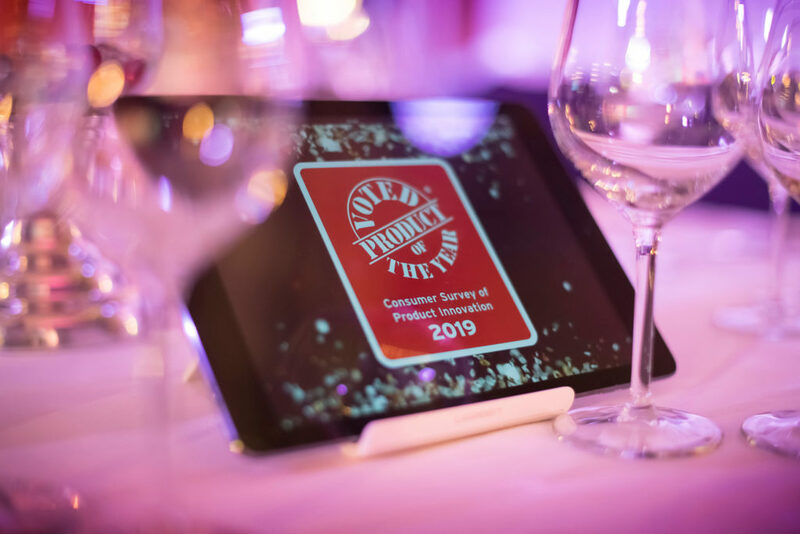 The famous Product of the Year logo, which was awarded to over 50 standout products last week, helps signpost the public to the best goods on the shelves, to give shoppers more confidence in what they are buying. As every year, I have teamed up with Product fo the Year who have very kindly offered one of their unique goody bags worth over £220 to one lucky reader. I will be running the London Marathon 2019 to raise money for the Cancer Research UK charity. Please Sponsor me. Thank you. It would be interesting to see how some of the Products of The Year compare with similar products that I currently use. So many fantastic products. I almost wouldn’t know where to start! I’d love to win this as there are so many great products that I haven’t tried before. Thanks for the competition. This sounds great some fab products in there but would like to try the new ones that I have not used yet. I would love to win as I enjoy trying out new products. This prize includes a fantastic selection and would certainly save me a few pounds on my shopping bill! It would be great to try out all these top branded products! I would share with my Mum. I’d love to win this. So many products here that I haven’t tried and would love to. It’s like a bag full of someone else’s shopping. How exciting is that?! There’s something amazing about a Product of the Year bag and everyone wants to get their hands on one. So many new, exciting and innovative products. I love to get to try new tried and tested products, I tend not to buy a lot of branded products becuase of the cost but when you know they’ve won an award and you get to try them and like them, then I’m more likely to buy them in the future. I’d love to get my hands on great products I already use and more importantly, getting to know and try new products! I always take an interest in the POY awards, it’s great to see the best new products. I’d love to win some! Lots of fabulous products, would love to win them. What an amazing prize. Would love to win this, to try all these great products. I need to do a spring cleaning and bless my friends and families with the goodies!! A fab bundle of products that would really come in useful and help us out during a tough month!!! I would love to win to try all the fab products. It would be like Christmas come early. If I won I would probably donate some of the products to my local food bank. So many amazing products l haven’t tried so would love to see how they all fare, great giveaway! I always follow the awards so would be lovely to get involved and try all the products for this year. Wow! I would love to win so I could try the amazing products I haven’t tried before! Gives me the opportunity to try new things and when you’re on a tight budget all donations are gratefully received!! It would be a wonderful treat to receive all these top voted products. I’d be so thrilled to win. This looks fantastic with a huge range of products! Because I’d love to try out all these great new innovative products! I would love to win aas it would drastically reduce my shopping bill for a few weeks, and it would be nice to tey some new great brands I haven’t teied befre. It would be a lovely surprise to receive all these goodies. I love trying new things, it’s all too easy to get stuck in a rut and just buy your regular brands all the time. I would love to win to help with my household bills, try some new items out and to help some other family members out by giving them some things out of this massive bundle of goodies. Such an amazing prize – thank you so much for the opportunity to win! I would love to have the chance to sample some winning products and give my family the chance to enjoy them too. As this would be a great Mother’s Day present for my mum! I would love to win as it would give me a chance to try products that I wouldn’t normally buy. I would love to win to be able to try some new products that perhaps I hadn’t thought to use before. There are the best products, I would love to try them! fantastic range of a selection with big brand names to try! It’s such a fun bundle of products to try. On a tight budget so I’d love the chance to try before I buy and avoid any costly mistakes! I’d like to win because there are so many exciting things in this goodybag! Because it is such an amazing prize. These bags are like kids’ goodie-bags! Love one! I’d like to win because the items come in a bag which I’ve heard is excellent quality and perfect for putting shopping in plus it’d give me the opportunity to try out some new brands and products. 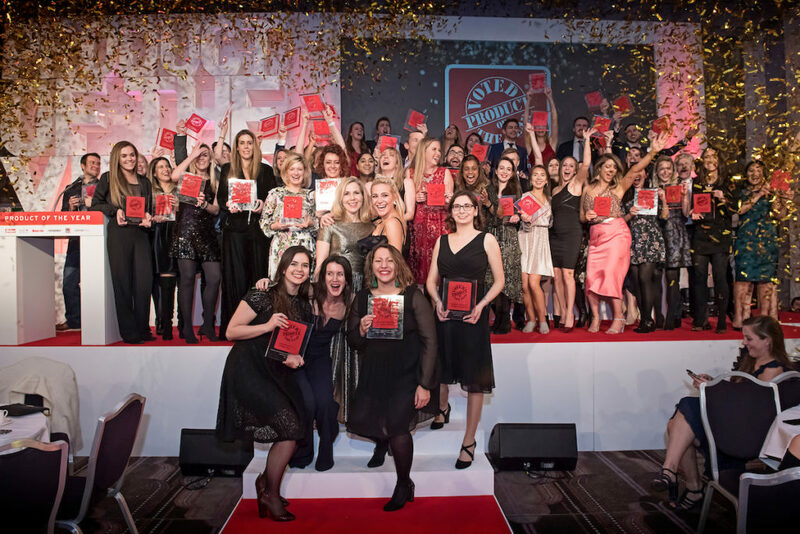 I don’t suppose I shall ever be lucky enough to attend one of these fabulous awards nights but I would love the chance to try all the products and imagine I was there. To try new products I might never have tried! I would like to win because I can see so many products I would like to try. It would be great to find out why they were the best. Wow, would love to win as I usually have to buy own brand products. There are some great brands here i’d love to try! It would be fantastic to have the opportunity to try so many amazing products – like Christmas come early! Having a whole lot of products together that are of great quality would be lovely. I would love to win to share these great products with family, as well as enjoy using many myself. some amazing products in this year’s lineup as always. What a lovely prize – always look forward to reading who the winners are as an easy way to find out about new products on the market. I’d love to win because there are lots of products here that I haven’t tried yet. There’s some fantastic products that I’d love to try! Looks like some excellent products have been chosen. It would be great to try so many new things and see why they’ve been picked as winners. I have always wanted to get my hands on one of these so that I can try everything out. This would be a perfect treat as we have have spent a lot of this month’s money on our rescue puppy! All runners want to finish the course and finishing the course in this case means winning the items. Would love to try some new products. Love trying new products but there are also some firm family favourites here. I love trying new products, this would be a great opportunity to. Would love to win this treasure trove of goodies, some that I have tried and love and others that I would really love to try! Wow of course i’d like to win this fantastic prize. great opportunity to try thing you wouldn’t normally buy. Some of my favourite things in there, some others I would try, and others I would share with friends and family. 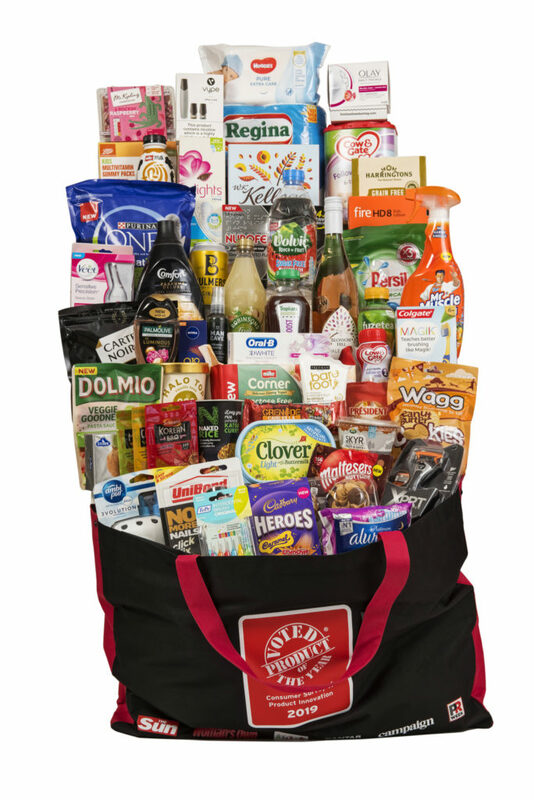 To win this goody bag would be simply amazing, not just for the fact that it contains the products of the year, but it would certainly help save me at the till down at the supermarket when my purse strings are getting tighter by the day. To be completely truthful, money is tight, and we just don’t get the chance to try new things anymore, as we tend to stick to such a rigid budget. Be lovely to say to heck with it, and have all these lovely goodies to test! x Thanks so much! Some of the products are new to me and this would be a great chance to try them, before I buy them. Its easy to get into a rut of buying same old, same old. It would be great to win this to try new things and be more aware of the newer products. I’d love to try out the products to see if I find any new favourites. I love trying new things, my hubby would love all the chocolate and the dogs would love the treats and I would love to try the new cereals. I’d like to win simply to be able to try a bunch of new products I wouldn’t otherwise try. I think it would be fun. I would love to win to try all these new products and hopefully find some new favourites! I would love to win because i love trying new products and i think opening this up would feel like christmas. Great selection of products – something for everyone! It would be a great way to try new products that have been rated so highly! I’d love to try out some new products and find some new favourites! This is a great way to find out about new products that have all been deemed to be the best in a particular segment. I would love to win to stock up on my favourites and try some new products. Who wouldn’t want to win this fabulous bundle!! Its a big help towards the monthly grocery bill for sure. It’s great discovering different brands that are recognised for their quality. If they’ve won product of the year, it’d be great to see why. I would like to win because there are a lot of products that I have not tried but would love too. This great prize includes much loved and well known favourites plus new products I’ve never tried, that I’d really love to try, and there’s something for all the family, even the pets! I’d love to win! I would love to win as only the best prodects have made it into this selection so of course I want to try them! There are so many products as part of this bundle that I’ve read amazing reviews on, would love to try!! Because then I get to try some fabulous new products!!!!!!!! I just love trying new products, especially those that have been highly recommended. It’s a great bag of goodies and I love them all! I would love to win one of these super goody bags because they are full of quality products and none of them would go to waste with me in charge of them! I love trying new products and there’s something here for all the family. It looks amazing! I would love to try all of the great products. I would love to try all these fab products, most of which I’ve never tried! I would like to win because I have wanted one of these for years! I’d like to win as this would be an opportunity to try a whole heap of guaranteed quaility. How fabulous that would be! I would like to win this for my nephew who has just bought his own house…..a few essentials willgo a long way for him. This bundle of products would be a treat and a help. Would be great to try out some new products and to share with friends and family. A fabulous selection of great quality products, that my family could certainly put to good use . There’s a good few products I have yet to try for myself. Great prize, would be like a hamper but full of useful things to last for ages. Hi I’d love to try a few things out of this bag myself and then decide how to distribute things to friends and family and people in need! I enjoy trying new & different products. Winning this would give me the chance to do that. It would be amazing to try all these new products, knowing they have been chosen because they are the best. all the products look fab and I’d love to try them all out and see what the fuss is about! I would love to win because, like a lot of people I tend to stick to the same shopping list week after week. This wonderful goody bag would give me the opportunity to try new products and maybe change some of those set items on my list. I would love to win as it would be great to try products I may normally walk past..and to find new products that our family would love. I would love to win to try out all these amazing products! What a fantastic haul of prizes! I’d just love to try all of the fab products!! I would love to win a Product of the Year Goodie Bag because it is jam-packed full of items that I use everyday. However, these products have been chosen as the best in their category, so I would love to see how these products differ to the brands I usually use. Award winning products – tried and tested; well worth the money that I’ve invested, I turn up my nose at run of the mill so to win this bundle would be such a thrill! I would love to win this delightful prize – filled with a great selection of useful products and food. I would enjoy sharing this with my family. I would love it because it is filled with fantastic products I am dying to try. I’d love to win as it would save me money on my monthly shop. what an amazing prize! like many others we are having not only a financially difficult time but also an emotional time at the moment with loss in the family and other health and mental health issues, i would love to win to give me a boost and to help me and my family smile again. good luck to all! All the products look great, An amazing prize. I would love to try them! I’ve only tried the Maltesers which are delicious. It would be brilliant to try all the other products. I’d love to win because there;s something for everyone, even the dog, fingers crossed! Such an amazing prize. Lots of new things to try. I would love to win as there is so many fab products. Some I havn’t even tried so would be such a treat. would love to win as this has so many fantastic products in. There are so many cool goodies! this would be so cool to win! I would like to win for a boring reason, my brother in law is buying his first home and so many of those products could make a hamper to start him off. A few yummy mummies in the family & would be awesome to bring them some new things to try & share there new discoveries, especially good old mum! Wonderful prize, if I win it will be a great chance to revisit some old favourites as well trying some new products. Amazing I love trying new things! Real people making great choices, count me in! Because the products all look amazing and I would love to try them! I’d love to win a goody bag as it would give the chance to “try before you buy” and I really need to get a bit more adventurous with my shopping list. I’m moving into my first house in Spring, so this would be the perfect package for me to start my new home with! It would certainly set me up with everything I need for a while. These all look amazing, I’d love to try all these out and see which ones i’d like to add to my regular shopping! Such a wide range of items – something for every member of the household! I would love to win because I am quite stuck in my ways in what I buy when we go shopping, my tried and trusted products. This would be a great chance to try some new brands and see if there are some new favourites we can start adding to our list. I would love to try out some new products and hopefully find some new favourites that I could add to my regular shopping list! Great photos from the night! Such a great range of products- something for everyone in the family!!! I love to try new products never know what your missing until you try them for yourself. I’d love to win so I can try out all the products! There’s something for everyone, many favourites but plenty of new items to enjoy! fantastic prize. if i don’t win might just have to buy them. There are so many fabulous products in here, some that I already use & some I would love to try. I think this would be great to win as it has so many good products in the goody bag that i know my family and myself would love to use. I love a lot of the products and would love to try the ones I havent tried yet! It would be a lovely opportunity for me and my family to try new products and new taste experiences. Who wouldnt want to win this!!! I’d love to win because I’m a first-time buyer about to move into my very first apartment so I’d love to try out the products whilst they help me to maintain and settle in my new home. I end to get stuck in my ways with shopping – I stick to the same products I’ve always used. This would be a fantastic way to shake me up & discover some new items! It would be a great chance to try out a bunch of products i’ve never bought before. So nice to try out lots of products that you know are going to be good! It looks like there are lots of great goodies to try out! I’d love to win because I like to try new brands but hate risking quality! I would love to win and try out some new products and also some of my favourites! Thanks for the chance! I’d love to win, so I can try some lovely new things. I’d like to win so I can try some new recommended products. I usually tend to stick to buying the same things. I would love the opportunity to try out all these things. For the joy of a big prize, with some new products to try and some favorites too. Fab Prize! Would love to win – it would be like Christmas!! I’d love to win so I could try all these great products. I love Pixie’s dress! What a fab prize! I would love to win and be given the chance to try all of the amazing products! It looks like a fantastic bag of goodies to share around the family! Nice to try new products too! Been trying to get my hands on a POY goody bag for the last few years. Buying our first home soon and would love to have this stockpiled so we have things to use as soon as we move in – especially the cleaning products. Be super useful for my little family! I would love to win to help make my house a home…spring cleaning and making delicious meals! It would so exciting to open it all, and I love to try new products. They are fabulous products, so of course I’d love to try them…fingers crossed! I would love to try some of these products, I usually go with a shopping list and try not to deviate from it, so we haven’t tried many of these products. Would love a chance to try all of these things! I know from experience that some of these products are amazing and I’m sure all of it would be useful to me and the family. I see that there’s some dog treats in there…my dog would love to chomp on them! I would love to win as it would not only make me exceptionally happy but i would share the goodybag with my family and a friend that is in need right now. Lots of things I have never tried and like most people a pile of free goodies would be super helpful in this economy! I’m so excited to see some of my favourite products there and some new products I would love to try! All the products look great and it would be lovely to try them out. I’d love to win, as I love trying new products! All them goodies to try, what a treat !!! Looks amazing, so many products in here I’ve not tried that I’d love to give a go! Because it is such a great prize. Would really love to win this! I’d love to give some new products a try, always end up in a rut with the same old things! This looks amazing: would love to win and share all the goodies with my family! I love things like this. What an amazing opportunity to try so many fantastic products! I would love to win for my family, we would share it out. I would love to try out all the products and maybe find some new favourites. I’d love to win because it would be like an adult lucky dip unpacking such a wonderful bag of goodies. There’s lots of things there I haven’t tried, so I’d love to win so I can test everything out. 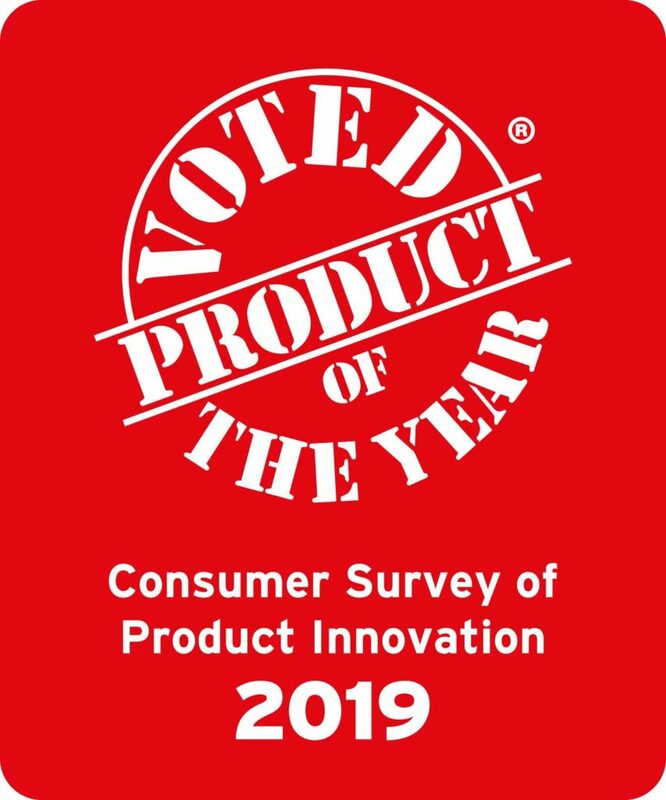 I’d actually really love to try all the products I haven’t used yet – they must be good to be product of the year and the ones I do recognise definitely are great! would love to be the proud owner of this! I love this blog! The products are fab and would love to try them out 🙂 Thanks for the opportunity! It would be a great way to try out products I had not heard of before. I would like to win because I wouldn’t need to go shopping for ages, I would get to use top notch products and make my own mind up about them. It would be fun ! It would be great to use all of those products, and see whether (in my opinion) there are ‘Products of the Year’. I would like to win because I’m on a very very tight budget. I would love to win to try out different products that I have never used before! I’d love to win because there are so many awesome things in there! What an amazing goody bag. There’s loads of products in here that I would love to try. Love to win to try out these products.Seems like a great night was had by all. It would make my day and I would love the see the smiling faces of my family! I absolutely love trying out new products, so this is the ultimate prize for me! Thank you. Would love to win this amazing competition! It would be so lovely to try quality products for a change instead of shop basic products..
Who wouldn’t! Me and my family would have great fun trying out all these products and some are already firm favourites. Love to win fantastic products some I have already used but there are lots more in this massive bag that I would love to try out. Great chance to try out varying range of products. I would like to win because there are so many great products in there – quite a few of which I would love to try. There are quite a few of these I haven’t tried yet and would love to. Would love to win and try some of these products that I wouldn’t normally choose when out shopping! Would love to win as I can see from the photo and description it include some of my favourite products but also products that I would really want to try . I have had a hard year financially, and would love to win! Love to win to discover each product. Great selection with awesome brands. I would love to win this and try all of these out! I’d love to win as I love trying out new things! There are so many fab products in this range that I haven’t tried. I would love to try out the best of the best! Angellamb says,. Can’t believe the prize, have to wipe my eyes, got to be generous, got to share with my family members, and our goods on display there! ( Thank you) ! It’s always good to know which brands and products are the best out there. It’s good you make it into such a celebration too. Wow, amazing prize. Thanks for the chance to win! I’d love to win, looks like there are so many great products in there! I would like to win because there are so many great brands and products that it would lovely to try them all. This is a great prize and a chance to try new products before buying. There is so many amazing products!! Who wouldn’t want to win!! I love Sally Rowland Phillips! What an amazing selection of lovely things! Because there are so many products in there I’ve not tried yet so love to get the chance. I would love to win to try all of the amazing products which are included. What a fabulous bundle! I would love to win because all these products look amazing! My parents are moving house and it would be a fab present for them. They really deserve to be spoiled after all the bad luck they have had. I would donate it to them if I won. Looks like such a fantastic selection of products that would be perfect for all the family! I would love to win this. I’m an expecting first time mum so obviously money is tight! Thanks for the opportunity. These goody-bags always look fab and would be great for a family to try to different products. It has such an amazing bundle of goodies which would suit all the family! It would be amazing to try such a vast selection of products there are some old favourites of mine here as well as products I’ve never tried before. To try all of these amazing new products. I’ve always wanted to get my hands on one of these incredible goody bags! It’s a great way of trying lots of new products without the risk of wasting money – I’m particularly sensible with my shopping choices right now having just had baby no. 3! I think there some great products in the bundle which would be very useful. I would like to win so I can try all these fab products and see if I agree they are winners! I’ve wanted one of these bags for the last few years – it’s jam packed with so many amazing (and practical) products! We are moving into our first home this year and this would would great to try new products in our new home! It would be fantastic to win such an amazing prize. This great bundle would keep me going for ages and great to try out all the products! There’s a lot of products there I’d never thought of trying so I’d love to give them a go! There are so many amazing things that I would love to try! I just love trying out new products. It looks so exciting. We are moving to our new home next week and this would be a fab bundle to win for our new home! It would be great to try out all these award winning products! It would be like doing my shopping without having to pay! What a bonus! An amazing prize – so many products to try. i would love to win.it would be amazing to try lots of new products that as a family we havnt tried before. This would be soooo useful as there are so many products that I use. Oh wow I have always really wanted to win a product of the year goody bag because there is always so many awesome goody’s packed! It would be brilliant to try everything out with my family. I would like to win this because, I ask you, who doesn’t want the best for their family? Products in there for each and everyone of us. I’d love to try some of these products as I have never used them before! So many great products would be wonderful to try them. What a fantastic bag of goodies! I would love to win! Because they would all come in so super handy! Love to win to treat my family! I would love to win this goody bag because it’s full of lovely things that I can try out with my family, thanks. I would love to win as I would love to try some new products. I’d love to try lots of new brands as well as having old favourites! This is such a lovely prize filled with lots of items I use & winning it would save some money on the shopping bill for a time! Would love a chance to try all these winning products for myself. I could be happily opening things and investigating them for days; a whole box of prizes! Who wouldn’t want to win a box of the best things of the year! There’s loads of stuff I haven’t had chance to try out so would be fab to win them! So many new products in this winners selection, would love to try them before buying them. So many great products and brands i have yet to try. I think it would be an amazing opportunity to test out a wide range of new products without being out of pocket. Money is tight, but we are always keen to try new things and this would be a great opportunity to have a little indulgence. Those things that we don’t use at home, we always give to local food banks or homeless shelters and as some of the items in the giveaway wouldn’t suit us, we would enjoy being able to give more than usual witho our donation too! I love to try new products with my family so this would be perfect for me! It would be great to try lots of new award winning products and find some new favourites to use in the future! All of those products are calling me. They are as tempting as a cream cake. I would love to try out all the products. It would be great! I would love to win this prize as it would be an opportunity to try some of the products in the goody bag that I have never tried before. I’d like to try all these products, I might find something I’ve been missing out on. Would love to get the chance to try all these great things. The products of the year are always fab and well picked. I would love to win all these products so I can find out why they won product of the year. To get all those products in one go, rather than only being able to get one at a time when I can afford it would be amazing. Such great products and well deserve their product of the year award! It would be great to try some new products that have already been rated by other shoppers. Wow, this looks amazing. I would love to try them all. Some great brands and some new things I would love to try. It would be amazing to try new products that I haven’t even thought about before! I’m moving out in a few weeks, so this would be a dream! I’d love to win to try some new products that have a ‘seal of approval’. It’s always difficult to choose products without knowing if they are worth the hype – these products are certainly winners! I love seeing the products that people thought the most of in the year, it gives me a chance to try something new! Would be great to try different products. There are some really useful things in there, and a few new things I would like to try. So may great products – I want to try them all!! Would be good to try some new products. Id love to win as these products look so amazing. I have wanted to win one of these for years! I would love to try all these amazing products. What a fun night had by all, it looks like. This would be a very practical prize, where we would actually know that the products within won the awards. I’d love to win as it’s a great way to try lots of products that I might not have thought of trying before. all those amazing products, who wouldnt want to win! so many fab products i would love to try out!! So many fantastic goodies – I couldnt resist enterng! What a great thing to be involved in!! This is amazing prize 🙂 I would love to win as this is very practical gift and I would love to try all the best products!